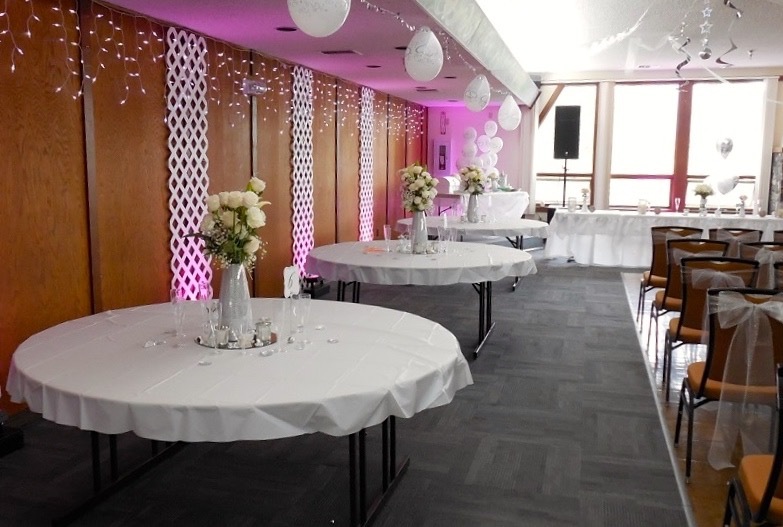 Whether you are searching for the perfect wedding location, a business retreat, or social function, Viking Hall is the ideal place. Conveniently located in the heart of Anchorage, we provide a quiet, affordable, and flexible option for your next event. Contact Us to View the Facility, Check Availability, Reserve a Date or Ask Questions! The rental space is approximately 4,500 sq ft and includes a main hall, kitchen, coat room, foyer, restrooms, and entry area. The main hall is 50 x 60 feet and accommodates up to 150 guests. Main hall features include a large stone fireplace with gas insert, generous picture windows facing the Chugach Range and a large hardwood dance floor. Tables (6’ and 8’) and chairs are provided. Round tables are available for rental. Optional audio/visual capabilities are built into the main hall. The kitchen contains spacious counter areas and commercial quality range, grill, double oven, refrigerator and sanitizer dishwasher. Also included are 2 pushcarts, 2 large coffeepots, microwave, under-counter freezer, and garbage cans with liners. No kitchen utensils are provided.